In order to be heard, the common voice has been known to taken drastic measures, yet little does society realize individuals have often chosen music as a platform. 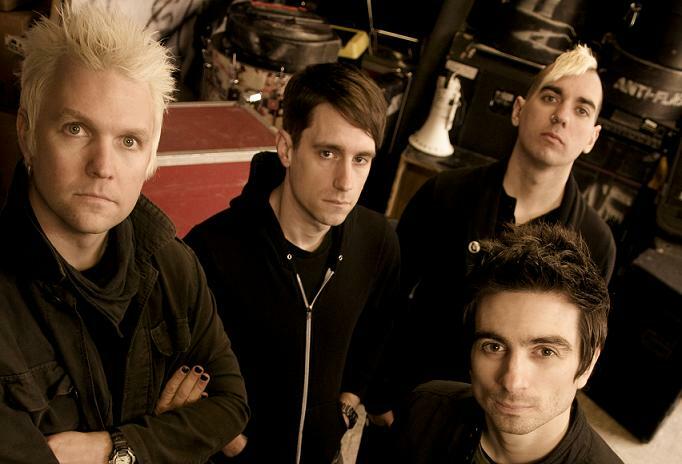 It helps project perspectives and emotions, letting instrumentalists connect with those willing to listen and Pittsburgh’s ANTI-FLAG know that all too well as the punk rock group are respected pioneers known for their outspoken views. With preparing to take on North By Northeast in Toronto, vocalist/guitarist Justin Sane discussed being influenced by the band’s candid followers, how that’s affected their upcoming ninth LP and why he hopes they can continue to be a prominent voice. If a picture speaks a thousand words, a song must speak a million. But with less people buying CDs has it become harder to get your message heard? That is a good question. Most of our songs are only three minutes long so there’s only so much you can say. Some of the time, we would put information regarding the topic of a particular song into an album’s packaging and in that respect, we’re still able to reach out to people and put out a certain idea on the airwaves they can hear. I think accomplishing that next level of connecting with people has kind of been lost in this world of downloads. That type of information to me and to others, is really important. I know that because I’ve had people come up to me at shows and say “Wow, that song was cool and I had a chance to read the insert and the additional information and man, it’s really interesting, it made me think”. Though some are vaguely aware of the issues you sing about, they may not be aware of Anti-Flag as a band. When playing events like Vans Warped Tour or even NXNE, how do you approach such a diverse crowd? It’s very easy to associate with Anti-Flag in saying we’re not a certain skin colour, we’re not a flag and we’re not a country; we’re human beings and we treat each other accordingly and see each other accordingly. In a nutshell, that’s what Anti-Flag stands for. For those who can’t see that, we kind of display that message on stage. Beyond that, it’s up to people to interpret it as what they want. We deliver the message and it’s out of our control as to how they receive it. We hope they take it for the meaning we want them to understand, but that’s not always the case. Which do you find to be greater: the amount of people who will respectfully disagree with you politically or those who will speak out against you? It’s a bit of both really. In general, the people that are interested in punk rock music have an open mind in giving a message a chance and hearing us out. That’s the case for all groups of people and it could be for all kinds of reasons. I think people who react to Anti-Flag in a more negative way react to us differently after they see us play live. That comes down to them taking in our message and realizing what it means and what we’re trying to push out there. It also challenges people’s ideas as well. Those that come up to us and talk to us understand we’re reasonable people (laughs) and not trying to make everyone take sides. We all have pre-conceived ideas of things and the great thing about Anti-Flag is we challenge those ideas and quite often others feel as if they’ve changed a bit. I love people that can do that for me and it makes me realize some love that Anti-Flag does that for them. Do the outspoken fans, either with or against you, inspire you in anyway? Yeah, definitely. For one thing, if they think we’re wrong, it challenges me to find a new way to relay a certain message to them. We’ve got to find a way to bridge the differences between people and the best way to do that is to actually listen, hear what people have to say and find some sort of common ground to agree upon. That’s kind of what Anti-Flag does. Even at our shows, we believe that everybody regardless of skin colour and gender, should have a good time at our show. But even in that aspect, everyone has to respect each other when they’re there; we don’t tolerate discrimination, especially at concerts. From a individual’s perspective, people can find common ground by simply respecting one another as human beings and not thinking about each other’s beliefs. Reinforcing and accomplishing that at a show is really inspirational. Everyone knows that aside from festivals, spring and summer is a time for new beginnings; have you guys had any as a group lately? I think we always have new beginnings (laughs). It’s interesting that you say that. Going into studios you haven’t been in for quite some time and playing festivals, that’s really what keeps you going as a band because you build new relationships when you’re traveling. As far as our career goes, we have been working on some new songs and are hoping to release a record in the Fall. I’ve also been working on a solo album as I haven’t done anything since my last record which was six or seven years ago. It’s nice to do that because Anti-Flag has a certain role and purpose to it and there’s a specific community around the band and at some point that can become tiring. It’s nice to be able to explore, do something different and write because it’s pretty exciting. I actually played some material for the Sounds Like A Revolution documentary which was a great experience to be a part of. It’s been interesting to see the band’s involvement in side projects, especially with the other guys having started White Wives. Do these projects have anything to do with the delay of a new record? Well, we had put out two albums in two years and I think at that point, we all needed a little bit of break. It kind of started with me doing my own thing for a bit but it’s just us trying something different. We’re still doing things as Anti-Flag but there comes a time when we need to step away; I don’t really understand why. Like with me and my solo stuff, it kind of helps me expand my artistic horizons in a way and do something in a certain degree that Anti-Flag cannot. It’s not taking anything away from the band as it is our number one thing, it’s our favourite kind of music to play and that’s why we started the band (laughs). Like when I first started it, I tried to find people that actually liked that type of music and wanted to play it (laughs). In the end, trying new things does bring experiences back to the band and make things more positive. Music is such a dynamic thing and in order to be a band for a long time you have to find ways to keep things fresh. Has that affected the group in continuing to write and record? As I said before, we’re really hoping to release the album in the Fall. We’ve been recording over the last couple of months and will be finishing up during the end of summer. There has been some ideas for a title but nothing confirmed yet; we’ve thrown around a few things and one of them is Magnum (laughs). It’s a reference from Zoolander. I think now, it’s definitely going to be the name of the new record (laughs). The last few albums you’ve released seemed to be in direct conversation with certain actions of the American government. With so many changes the past few years, what should one expect from your upcoming material? With all due respect, I don’t think there has been a lot of changes in the American government. It’s kind of all been the same. President Barrack Obama is a slight improvement from former U.S. President George W. Bush, but not by much. The conflicts being faced by the insurance companies and the medical industry is going to affect a lot of people as it’s going to leave a lot of them behind due to adequate health care. As far as the financial crisis goes, it’s been one of the biggest ones in the world. There’s no regulations telling Wall Street to stop doing certain actions that led to this crisis and the current state of the economy. Afghanistan is still prevalent, though anyone who’s known about the issues there for quite some time will tell you “the war” there is a lost cause. They’re killing more Afghan civilians than they ever have before. I can go on and on about what hasn’t changed. There’s a still a lot to talk about and there’s still a lot people need to know about. Like we had this Fukushima nuclear disaster and even after that, Obama has stated he wants to make nuclear energy and make it a very important part of the energy policy of the United States. He’s done a lot of the right things but when you look at what he’s done, it doesn’t really add up and make sense. That’s something we as a nation need to realize and it’s something Anti-Flag as a band can tell people through an artistic output. With so many issues people need to take note of, does your new material focus on them or is it more of a grab bag of ideas like your older records? I think it will discuss a number of key issues but it will also talk about things we feel strongly about. Anti-Flag has always operated that way and I think we will continue to do so in that manner. Looking at the songs we’ve written, the new album is an angry record. Personally, I’m pretty angry and more so with people’s apathy. When you have an honest look at what’s going on in the United States, our work is cut out for us and I think people are just getting to understand that. A lot of them are frustrated with what they’ve seen happen and how certain policies have affected the country. For instance, George W. Bush use to say all the time that we don’t torture people but we’ve put a burlap sack over someone’s head, handcuffed them and made them stand in the same position for 12 hours straight while there’s music blaring at them at a hundred decibels. That’s torture. If someone disagrees, then they should be put in that same position for an hour. Our current administration hasn’t really done anything to face and solve issues like these. With that, what is your biggest goal as a band for the next year? As a band we always speak our mind but I think everybody has to make a choice as to what they truly believe in and once you find that, you have to decide whether you have enough courage to be willing to come forward and be public about it. I’m very sure this band can do that and come together as a unit. If we try to attempt that, regardless of the outcome, we’ll feel as if we have accomplished something. I think we’re really at a point in our planet’s existence where we don’t know how to prevent people from affecting the environment. Part of the reason for that is because there’s so many issues that we just look away from and pretend that they’re not real. 25 years from now, I personally just want to be able to talk to my grandkids when they ask why I didn’t try to stop all these problems and say “I knew what was going on, I was willing to speak up for the right thing and I tried to do the right thing”. It’s important for us as a band to be really brave about saying things we believe in. There are consequences to that but I hope we can have the courage to stand up. what an interview. Justin is one truly inspirational dude, just wow. pretty excited for the new album though (LOL at Zoolander joke). I second that. A new album from AF can’t be bad! Great interview. Justin is such an influential punk rock musician. Anti-Flag, if you’re reading this, please don’t name your next album simply “Magnum.” What I really liked about all your albums is that they’re hard-hitting political titles such as The People or the Gun or Die For the Government. To me, “Magnum” alone seems to not represent Anti-Flag. And I love strong political album titles such as NoFX’s The War on Errorism, Rise Against’s Siren Sound of the Counterculture, Bad Religion’s New Maps of Hell/ The Empire Strikes First.